Miss Ingredient is back at L'Epicerie in Portobello Road for a Friday night Provençal Summer Supper Club this Friday 20th June. This time it's seasonal French French dishes, inspired by her time spent working on the Riviera. Last month sold out, so don't delay! PS - it's BYOB! 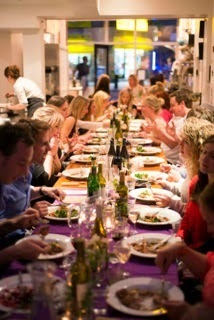 "After last month’s hugely successful Spring Supper, MissIngredient is hosting another evening of sumptuous treats. Transforming L’Epicerie Café into a beautiful bistro on the French Riviera, she will be bringing you an exciting and indulgent menu, handpicked to showcase the best of seasonal southern French dishes. So bring some rosé wine and look forward to another memorable evening of ambience, degustation and indulgence! Judging by the sell out success of the Spring Supper, we recommend that you book your tickets soon to avoid disappointment."